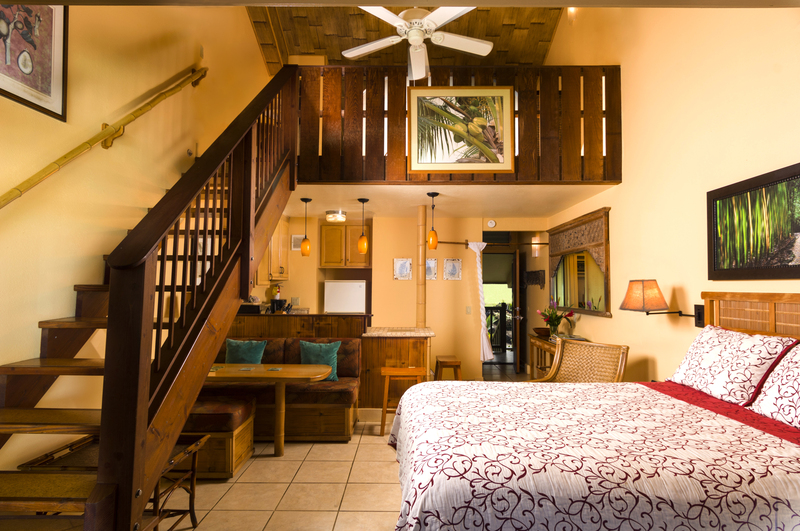 “Alau” – Unit 202 – is an upper-floor, lofted, ocean-view studio vacation rental located in Hana Kai’s Mauka Building. There unit accommodates 1-4 guests with 1 queen bed on the main floor and another queen bed in the loft. *Note* Sleeping in the loft June through October is not recommended, due to the higher temperatures at that time of year. Expanded sliding glass doors open onto a spacious covered lanai with teak furnishings and a breathtaking view of the pacific ocean and the Hana coastline. Porcelain tile floors and counter tops, tub/shower combination with custom tile details and bamboo accents throughout.